As e-commerce markets expand and merchants realise their potential by expanding into new markets and countries, the necessity to adopt a more risk based approach to selling online, has become more prevalent with the threat of online fraud. At eCOMM Merchant Solutions we recognise the importance of employing techniques to guard against fraud. Fraudsters have become increasingly sophisticated in obtaining personal data to commit acts of fraud and obtain customer information. These attacks undermine merchant businesses and directly impact both the customer and the retailer. Implementing fraud strategies and managing chargebacks effectively within your organisation will ultimately safeguard you and your customers and limit your exposure to losses as a result of fraud. To assist you in the fight against fraud we have provided some tips you can adopt to manage risk and chargebacks within your business. eCOMM Merchant Solutions recommends a number of strategies that merchants can use to help limit exposure to Fraud and to develop an all-encompassing protection approach. The key to managing risk and fighting fraudsters is to build prevention, detection and monitoring controls into your business. Only the individual merchant can determine which procedures to implement in order to maintain a correct balance between fighting fraud and accepting credit cards from legitimate customers. Know Your Customer (KYC). By calling a customer with the information provided you can further confirm the security of sales. If the person contacted at the phone number provided doesn't recognize the name of the customer, the order is likely fraudulent. If they are available, utilise CVC2 (Mastercard) and CVV2 (Visa). These two numbers are the three unique digits on the back of a Mastercard or Visa credit/debit card. These are used in situations where the card is not present (CNP Transactions), e.g., mail order, telephone order and online card transactions. If a transaction is not made face to face, it is a good idea to send a confirmation directly to the cardholder's address to help identify the transaction when it appears on a billing statement. Process refunds to your customers' accounts quickly, always using the same card number from the original sale. Stop recurring transactions that a cardholder cancelled; this will reduce the number of repetitive chargebacks by the same customer. Always adhere to your returns policy and make sure your customer has a clear understanding of the returns procedure. This helps with reducing chargebacks but also saves valuable time and resources within customer services. Late night orders - Fraud increases late at night. Ordering in high volume - Cyber crooks don't care how high the bill is, since they don't intend to pay it. E-mail address - E-mail addresses which have no apparent connection to the customer's name or include random characters could be potential attempts to mask identity but again, this is an indicator. Repeated attempts - Repeated attempts on the same card number must be treated as suspicious. Control employee access to financial systems. Analyse customer behaviour and activity so as to understand your business risk indicators. Work closely with your business partners in understanding how you can leverage fraud control to best suit your business model. Have the relevant Security and Fraud policies required to maintain a risk based framework within your company. Understanding the reasons behind claims from your customers can help identify the main cause and provide you with valuable information on where you need to make changes or consider adopting a new approach within your business. 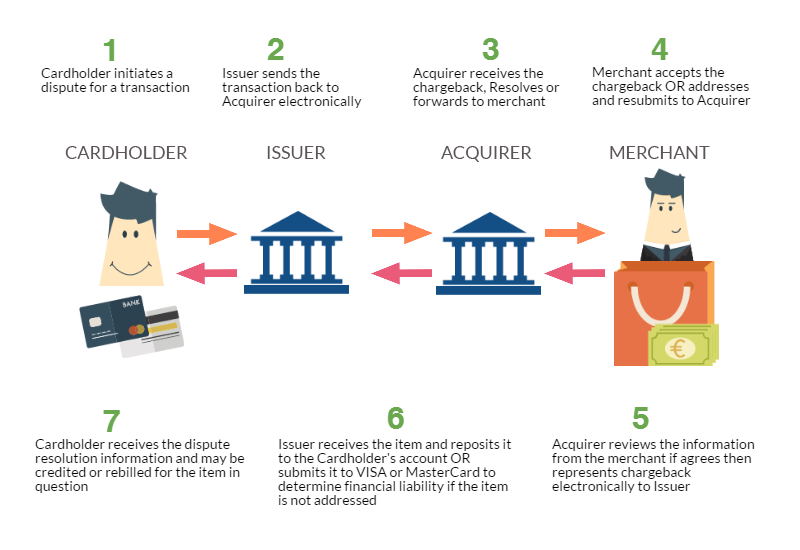 This helps to reduce chargebacks but also saves valuable time and customer service resource. The best approach to prevent chargebacks is to create best practices that are followed consistently by all employees. For example, always process a refund back to the original card number in a timely manner. Chargebacks can cost you time and money – but it's important to remember that many chargebacks can be prevented and quite often, it begins with comprehensive employee training.